Although I am not allowed to sit for long, I finished a few things. First is a picture of my crazy quilt square that I am doing for the 2008 Beaded Journal Project. I will look up the blog for my next post. I managed to finish the last of the 3 Barbara's Patchwork Garden that I started. I just realized this is the red one! I finished it a while ago. I will try to clear my brain and post my black one tomorrow! The design is on the ANG website, if you are interested. Another thing is my biscornu. It is a Cindy Valentine design that was made for the Mississippi River Valley Chapter of EGA. Her email is cindy@cindyvalentine.com if you are curious about her designs. In this image, I have added the #8 Krenik in purple and then the purple Impressions. I still have not decided about that green floss. Is it overwhelming? Is the piece going to look like it has stripes? I did add the blue metallic to the middle of the diamonds. I considered using the green, but decided it needed that blue to keep some unity. Next is another band of #8 Krenik purple and then pearle cotton with an overdye layer on top. When I get part I finished, I will post a picture. But since I will be having some surgery, it may be September before I can work on this again. I managed to get a little more done on MIAC. I added the purple Impressions overlay, which I like, but I'm just not sure about the green metallic center and the green floss basketweave. I think I will continue stitching and decide a little later if I need to rip out the green. 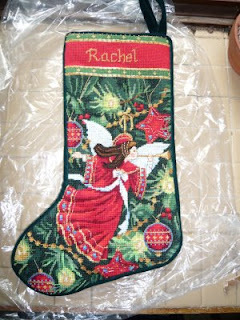 My finisher called and I was able to pick up my daughter's Christmas Stocking. It was a Dimensions kit and although I loved the colors, I didn't like the floss in the kit or the canvas it was stitched on! Now I know why people pay more for handpainted canvas. The finisher did I a nice job and my dd wanted to know if we could hang the stocking now. Nope. She will have to wait a few months for that. Now off to my frame to see if I can get some stitching done on my Mystery. After all, Gay Ann told us to stitch for 1/2 hour on these Dog Days of Summer. I will take any excuse I can get! I haven't been able to write for a bit because I went to visit my mom. The only real stitching I did was pull apart a bead project that I did not like. Hopefully I will be able to post more on that later. When I returned home, I was faced with a mountain of laundry so couldn't stitch for a while. But I finally sat down and managed to do a little more on my Mystery. I decided the piece looked too boring, so I ripped the watercolors out and used a more variegated piece. I also added the green metallic to the center and green floss (DMC 911) to the one corner doing basketweave. I still need to add the Impressions over the top of the center square once I finish the rest of the center. I am way behind everyone in Gay Ann's classroom, but I am learning so much as I stitch. It is interesting how choosing a certain piece of the variegated watercolours changes the whole piece. By adding the green floss, I have pulled in a little more of the green in the watercolours. It is fun to watch the piece develop.